During the quarterly state of the freezer address, you will notice there's always a large Skinny Cow box in the middle of the freezer. This is the treat box. It didn't take long for me to realize that saving treats in their individual boxes just wasn't going to work in the long run. If the treat box is somewhat empty, I will dump the entire box of new treats into it. If it's somewhat full, I may wait a bit. I know, it's not rocket science, but I wanted to share. So, if you want to be prepared for any snacking emergency, I humbly suggest the following four groups of treats. 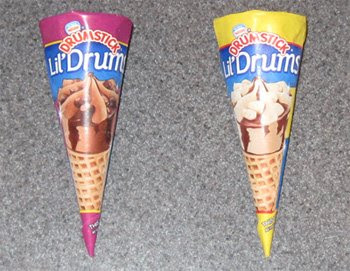 First, you need ice cream cones! There's a primal need that can't be satisfied by anything but ice cream in a cone. Second, you need sandwiches! 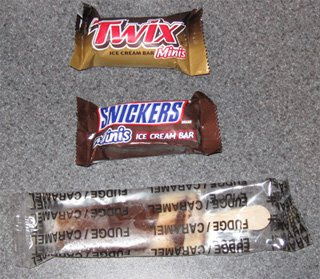 Now, this can adjusted based on your tastes ...or if you are like me, you can go with both a cookie based sandwich (not shown), a wafer based sandwich (far left), and something different (far right). 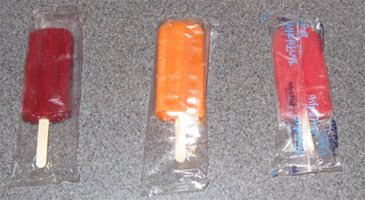 Third, you need popsicles! That's right, I'm not always in the mode for dairy, sometimes I just want something cold. I like to have at least one from Edy's in the box, but having a second choice is a good idea (whether it's a second Edy's flavor or possible another brand of popsicle). Fourth = EVERYTHING ELSE! I know, I could go on forever, but the reality is it's a free for all of what tastes good to you. If you can't decide which ice cream bar to throw in, why not pick a mixed box. So so so many choices. Now there is the danger of freezer burning a treat or two if you forget about them for say.....6 months, but overall, I love having the treat box and I wish I would have thought of it sooner. Diversity is the key, not just in flavors and textures, but thing of it from a caloric stand point as well. Sometimes you just want an 80 calorie treat. Other times, you may need to tide yourself over for awhile and you'll need a BIG treat.